This is an unprepossessing 19th century apple variety, which has long since fallen out of favour. In its day it was successful as a mid-season cooking apple. Its strength is that it cooks down to a smooth puree whilst not needing much sugar to counter the essential acidity of a culinary apple variety. There is still enough acidity though to prevent slices turning brown. It is a good example of the much wider choice of cooking apples available to the Victorian housewife, compared with today. 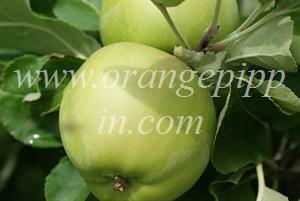 Potts' Seedling's real claim to fame is that it is, possibly, the parent of a very much more famous apple. The offspring in question is one of Scotland's most well-known apple varieties, James Grieve. The fascinating dilemma is that it is not known for sure whether Mr James Grieve of Edinburgh raised his eponymous masterpiece in the 1890s from a seedling of the workaday Potts Seedling, or a seedling of the far more glamorous Cox's Orange Pippin (or possibly both). The case for Cox rests mainly on the skin colouration. Potts Seedling is an un-interesting pale green/yellow, a far cry from the autumnal flush of Cox, some of which is apparent in James Grieve. However the case for Potts' Seedling is rather more convincing. The timing is right - although little-known today, Potts Seedling was quite widely grown in that period and thus readily available to anyone who wanted to breed new apple varieties. Its characteristic juicy but restrained acidity, soft glistening white flesh and mid-season ripening are very close to James Grieve, and far removed from the drier and inherently sweeter but more complex flavours of Cox. Another good piece of evidence is that both Potts' Seedling and James Grieve are easily bruised, whereas Cox, being essentially a harder apple, can withstand rough handling far better. Finally, the shape and underlying colour, and even the sheen of the skin of James Grieve seem much closer to Potts Seedling than Cox. Unfortunately, until genetic fingerprinting becomes available for apples, we cannot know for sure, but we reckon that James Grieve is more likely a seedling of Potts Seedling than Cox's Orange Pippin. We have a mature pots seedling apple tree in our back garden, planted when the house was built circa 1910. The crop is variable yearly, some years very heavy, others lighter, but always disease free even though the tree is left alone, except for pruning, no fungicide or insecticide or spray is administered. Low acidic, makes great apple pies or stewed with little added sugar, much tastier than cooking apples from shops. Highly recommended. Variety confirmed by Dr Oliver Gilbert of Sheffield University botany department. When I was young there was an apple known locally as Tom Pott's. Is this the same apple?